View into a hop field where hop pickers - men, women, and children- are working. The area, near Cooperstown, is dubbed "Hop City." 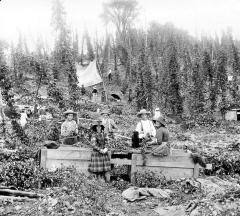 New York was a leader in the production of hops by 1849. The major producing counties were Otsego, Oneida, Madison, Schoharie, and Montgomery. Lantern slide is cracked, n.d.